Why Literacy is Important from Read Kauai! 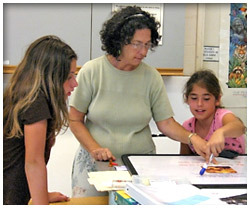 Literacy programs specializing in multisensory techniques. We administer specific language tests and learning style assessments to determine your student's strengths and weaknesses. We work with students and their parents, individually or in groups to achieve the goal of fostering positive attitudes and a better understanding of linguistic study skills. By successfully working with teachers and administrators as a team, we can create a comfortable, supportive learning environment and break through the �tough spots�. The plan and instruction includes research based scientific curriculums and methodologies. Elizabeth is a practitioner of Dr. Mel Levine�s All Kinds of Minds and Schools Attuned, students and parents can have an in depth look at learning through the eyes of the pediatrician and educator. Teaching approaches include a combination of Orton-Gilllingham, Lindamood Bell, Slingerland, Handwriting Without Tears, The Writing Road to Reading and Dr. Jane F. Greene�s nationally recognized curriculum LANGUAGE! Students experience a supportive multisensory environment in a small group or one to one setting, and/or the student�s classroom. The instruction utilizes appropriate methods of reading, writing, listening and speaking. These national recognized approaches are individualized and innovative with low stress - while fostering a positive self-image. Visualization strategies for comprehension are woven into instructions. The Learning Window assists in visual spatial development and writing. Along with language skills, the basic foundations of word processing and computer skills are available. Multisensory techniques require the learner to use all or most senses at the same time. The student will use combined abilities simultaneously to see (visualize and comprehend), say (listen and speak) and do (kinesthetic, hands-on or whole body) a specific task. By combining the weakest and strongest modalities while manipulating or moving objects, letters, words, phrases, and thoughts the brain is utilizing more than one input system. This combining technique accompanies the thinking process by arranging and rearranging language in a way that allows the learner to memorize and retrieve information. The goal is to have the senses or modalities trigger the information, thus creating a clearer pathway for the strongest sense to aid the other modalities to accomplish the learning task. This is a different and enjoyable challenge for the learner. Each lesson is structured, sequential, and cumulative according to the needs of the student. There is always a systematic presentation of material and constant review embedded in the lesson.